Quality of the food provided from these food courts doesn't meet the minimum level of standards. 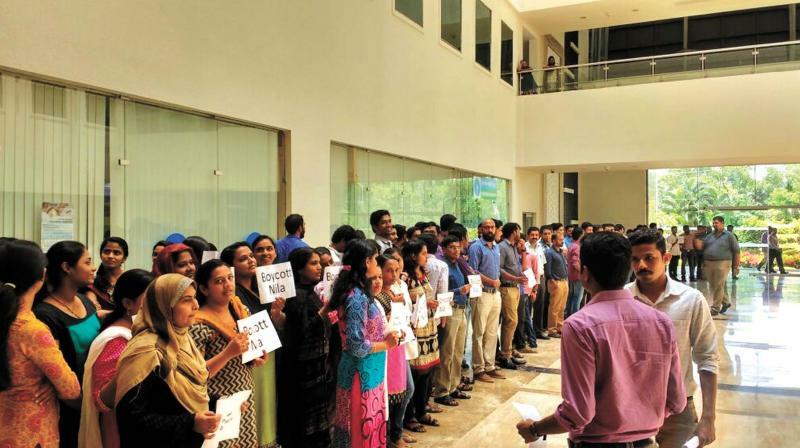 Techies protest against sub-standard food available at Infopark Kochi. Kochi: Techies have officially lodged a complaint to Health Minister K.K. Shylaja against canteens at Infopark for serving unhygienic food. They have made a demand for action against such canteens. ‘Progressive Techies’ an organised group of employees working in the IT sector of Kerala filed the complaint. They submitted that nearly 25,000 employees are currently working in Infopark Kochi and majority of these employees rely on the food courts inside Infopark buildings for their daily meals while at work. They lodged the complaint after repeatedly being served with unhygienic food at these canteens. Techies were even forced to conduct a protest march the other day after a leech was found in a snack. “Quality of the food provided from these food courts doesn’t meet the minimum level of standards. Since the employees do not have any alternative options, they are forced to have their meals / snacks from these food courts. Of late, quality of food has become even worse and has gone out of control.” the complaint read. Techies complained that many complaints were already raised about the quality of food provided from these food courts. Whenever these incidents happen, written complaints were given to the authorities in the past. However, no strong action has been taken on this and these food courts continue to work in the same manner. The Infopark authorities meanwhile have given assurances to the companies and employees that canteens violating the policies would be closed down.